By 1936, public interest in commemorative coin projects of the Unites States was at an all-time low. 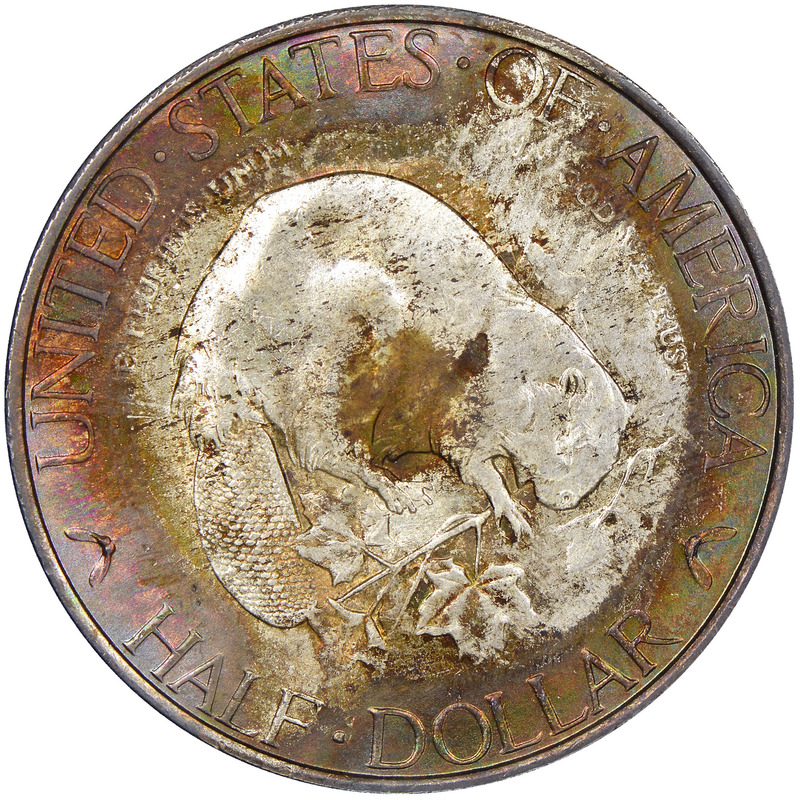 By this point, the Mint had already issued many different coins commemorating anniversaries of mostly local significance. The Albany half dollar was no exception. 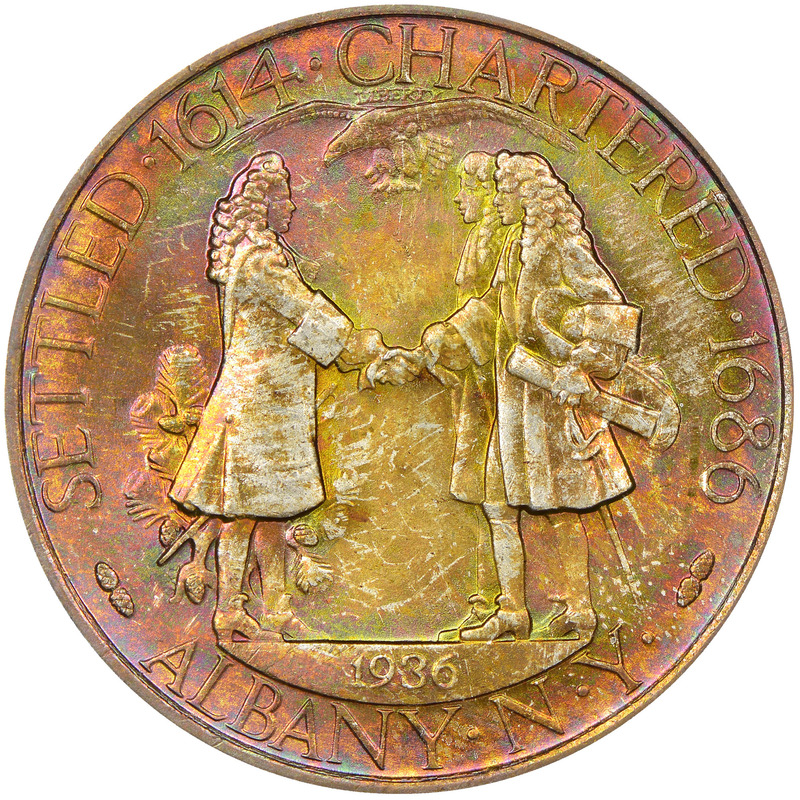 On June 16th of 1936, at the request of the Albany Dongan Charter Committee, a bill was passed to strike no more than 25,000 coins to commemorate the 250th anniversary of the charter of the city of Albany. Once the bill was passed, the committee got to work selecting a designer for the coin. Miss Gertrude Lathrop was the artist selected, as she was born in Albany and was a well-known sculptress. 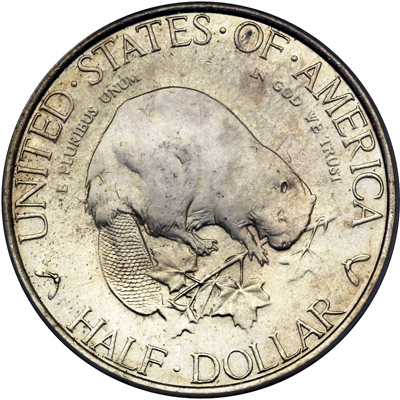 Her obverse design featured a beaver, a common animal of the area, with a maple branch (the state tree) in its mouth. The reverse depicted a group of 3 men dressed in period garb. 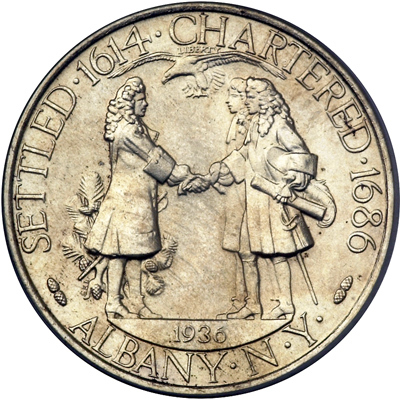 These men were to represent the first governor of the state, Thomas Dongan, bidding farewell to Peter Schuyler (the first mayor of Albany) and Robert Livingston, who were the two men that convinced Dongan to grant the city a charter in 1686. Surprisingly, the Commission of Fine Arts was for once happy with the design’s artistic merits and the entire mintage of 25,013 (including 13 assay pieces) was coined during October of 1936. 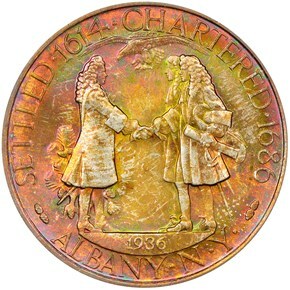 The coins were then offered at the price of $2 each by the Charter Committee. Unfortunately for the group, this price was much higher than the more typical cost of $1-$1.50 per coin. 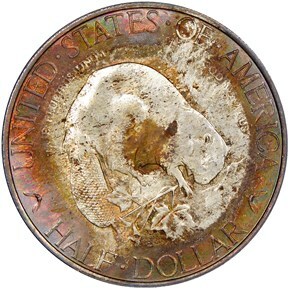 Coin collectors, who had already been assailed with nearly twenty commemoratives in that same year, let out a big yawn, and sales of the Albany half dollar fell far short of expectations. To its credit, the Committee refused to discount the coins for several years afterward, trying to maintain the integrity of its program. In a final effort to move the remaining few thousand pieces, the entire lot was offered to coin dealer Abe Kosoff at $50 over face! Unable to find interested backers, and likewise unable to tie up such a sum himself, Kosoff had no choice but to decline the offer. Accepting defeat, the Committee returned most of the unsold coins (totalling 7,342 pieces) to the Philadelphia Mint in 1943, where they were melted, leaving the total mintage at 17,658.